This is a project I have been dying to do for a LONG time. 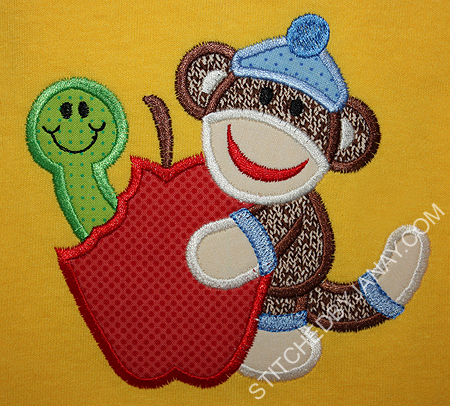 Designs by JuJu has released several sets of Sock Monkey designs (both applique and filled) that I have been collecting along the way. Honestly, I'm not even that big of a fan of the traditional sock monkey, but all of her artwork is PRECIOUS! Right before school started last year, DBJJ released a filled set of of back to school sock monkeys, but I've been holding out for the applique version, which she released this summer! 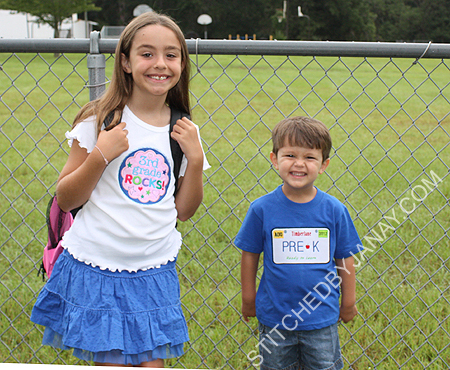 I didn't make my goal of getting these shirts made before school started, but Annaliese and Dashiell were able to kick off the second week of school in style today! 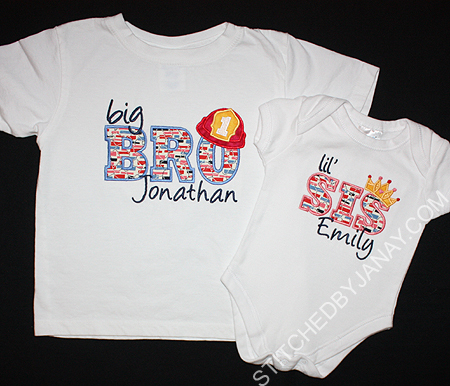 Aren't these adorable?!? I had so much fun watching them stitchout last night. And the cool thing is that my kids still WANT to wear matching shirts, so they were both thrilled to get dressed this morning. 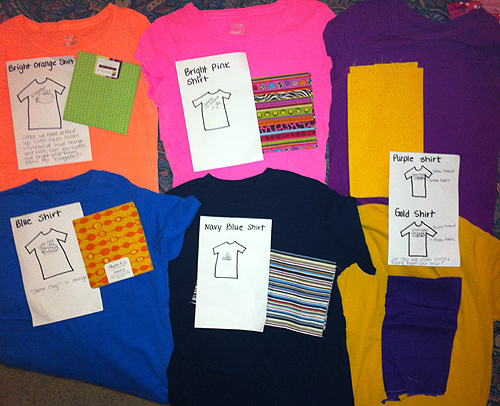 Hey, as long as my kids want to match, I'll be making matching things. It's already lasted longer than I expected! The pale yellow shirt for Annaliese is a LAT brand that I ordered from Rock Bottom Tees (I think) and has been sitting in my stash. After prewashing it shrunk in length, so hopefully she can wear it throughout the year, but she's so tall that it won't last forever. It is a large girls shirt. It's August in Florida so you know what that means, long sleeve shirts are in stock. UGH. I had to go to Hobby Lobby to get a short sleeved. Sometime recently they have changed brands, and their youth XS is no longer labeled 2-4. This shirt is huge on Dashiell. He should be able to wear it for a few years, or until he ruins it. ;) This shirt was prewashed as well. Notice anything??? A large girls shirt for my 8 year old and an XS youth shirt for my 3 year old. The exact same size. Sigh... If I knew anything about garment construction I would try to make that shirt for Dashiell smaller. Oh well. I guess boys can get away with oversized clothing. I've made this announcement in some different venues, but haven't really declared it publicly yet: I am going to be working at our church's preschool as Dashiell attends. While it would be more fun to drop him off and come home to sew, staying and working is really the most practical decision for our family. I made the same decision five years ago when Annaliese started preschool, too. I enjoy working with the staff and being near my preschooler. In conjunction with this I'm also scaling back my online presence. 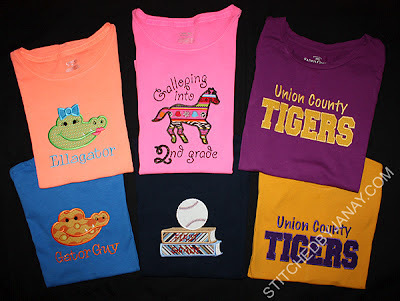 I LOVE the online embroidery community. Even though I'm not active there any longer, I am so grateful for Sew Forum and all the wonderful women that helped me out when I first got started. I was introduced to my favorite digitizers, downloaded lots of free designs to start my stash, received tips and inspiration from so many people... Honestly there are very few original ideas here on my blog. In recent years I've been an active participant in several groups/pages/forums which I have loved. BUT I have to take a break. As I reflect back on my spring/summer I had too much on my plate and wasn't as good of a mommy as I should have been... my mind was always somewhere else. I'm facing the fact that at the moment I have a self-control issue. A majority of it is because I genuinely enjoy helping others. I can't repay the God-given talents I inherited from my mom, nor the generosity of my mother-in-law, nor all the help/inspiration I received from strangers at the beginning, so I choose to pay it forward. I love sharing tips and promoting the digitizers who make my projects possible. But if I'm honest with myself... part of it is my pride, too. 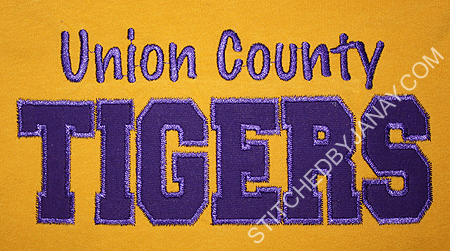 I like being the one who can identify the unknown font first, or point you to the perfect applique design for your project. I have caught myself telling my kids to wait a second while I look something up to answer a posted question. Or I'll check in via my phone while I'm supposed to be playing superheroes, etc. It finally dawned on me one day, no -- her embroidery project is NOT more important to me than this perceived immediate need of my child. My kids are my priority, not a bunch of women I've never met. Well, DUH! That sounds so obvious when I type it out. But I found it quite easy to slip into volunteer roles (which I really enjoy) that overtake my free time and more. So I have left all forums and groups except one. I mean, I need at least ONE outlet and connection to the applique world. But I'm setting some boundaries for myself -- I won't be popping in as frequently as before. I will still be working closely with a few digitizers -- those relationships are SO important to me, and they are my longest-standing commitments. I won't back away from those roles unless I have to pack up my machines for good! Have no fear, I'm not giving up my blog! I acknowledge that it's been pretty neglected in 2012 and probably will continue to be so for a while... there will be fewer projects to show off! But it has been with me from the beginning. 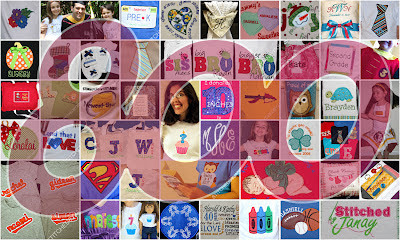 I do still consider it my online scrapbook and I want to continue documenting every project. Whew, are you still with me? I guess I had a lot to get off my chest. :) Now for my questions!! 800 is the number of the day not only because it's my 800th blog post, but because very recently I also surpassed 800 fans on my Facebook page. That is crazy to me, as well! I want to know who you are! Who is reading my blog? 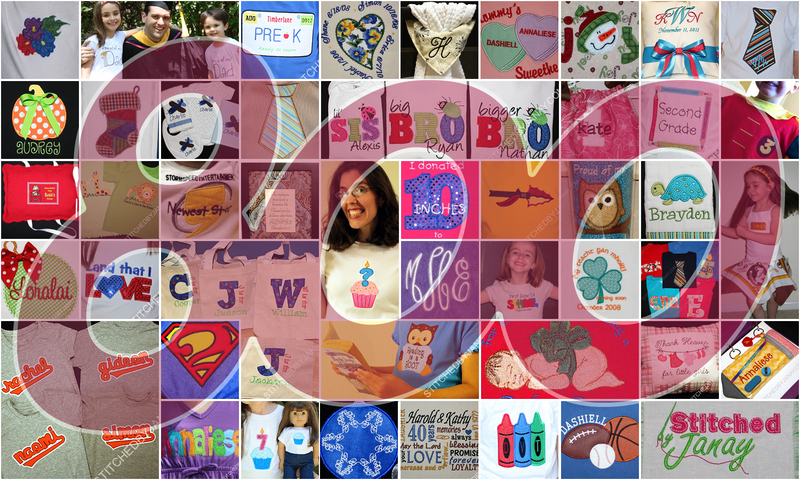 Are you a friend or family member that simply enjoys looking at my projects? Are you a customer that I don't know personally? 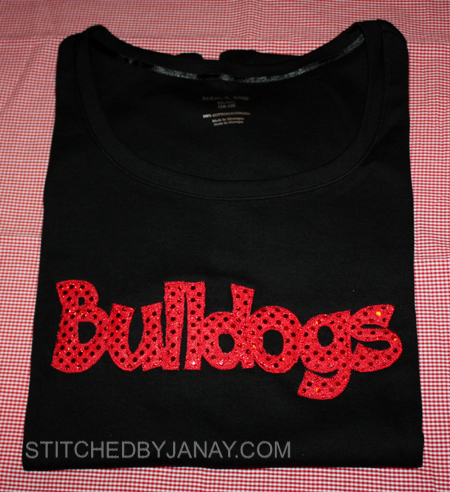 Are you a gift recipient of an item Stitched by Janay? 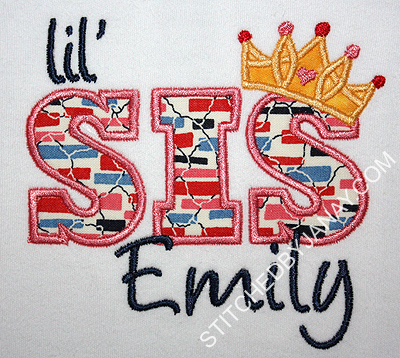 Are you a fellow embroiderer? Are you a digitizer? If you wouldn't mind, please leave a comment! I get lots of blog hits a day, but not a lot of interaction, so I'm curious who is actually reading. How did you find me? Why did you come back? And what do you want to see more of? Just pretty pictures and less words? ;) More tutorials and how-to's? If so, what specifically? I'm making no promises of course, but I'll keep your suggestions in mind. Thanks for being with me! Here's to another 800 posts! This ITH design is lined with no exposed seams. It's so neat to watch how EG's designs are constructed! This pouch features a front vinyl pocket so you can see the contents. 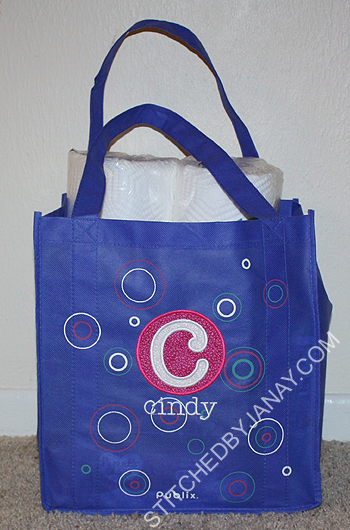 Believe it or not, this was the very first time I have used vinyl in an embroidery design. I'm anxious to see how this holds up to daily use by a third grader! 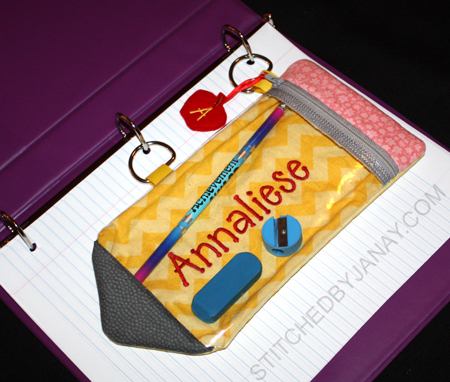 First of all I wanted to put Annaliese's name on the pouch just like it would appear on a personalized pencil. 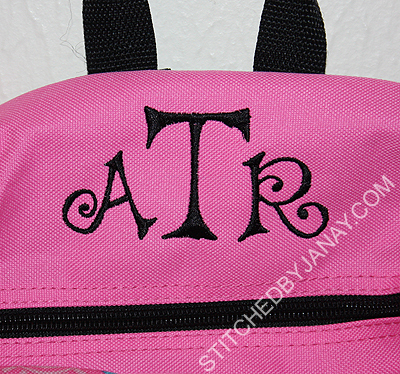 I asked Reen on her Facebook wall which piece of fabric needed to be monogrammed first before constructing the case. She confirmed very quickly that it's the last piece of yellow fabric that is placed on the backside of the hoop. I picked Itty Bitty from 8 Claws and a Paw to stitch her name on the new Riley Blake tone-on-tone chevron I just got in the mail this week. 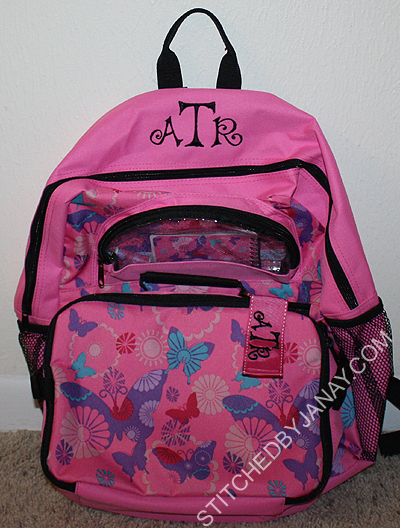 Another thing I added was an additional loop of ribbon/D-ring so that when Annaliese put it in her 3-hole binder it stays in place instead of sliding around. At the point in the directions when Reen tells you to tape down a loop of ribbon, I simply taped down an additional loop 4.25" below the first one. 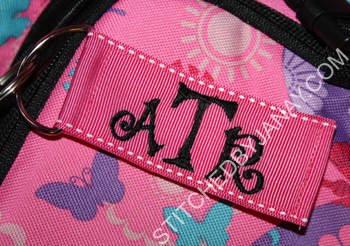 And finally with Reen's blessing I swapped out the A that came on the apple zipper pull with the A from the font I used for her name, so it was very matchy-matchy. 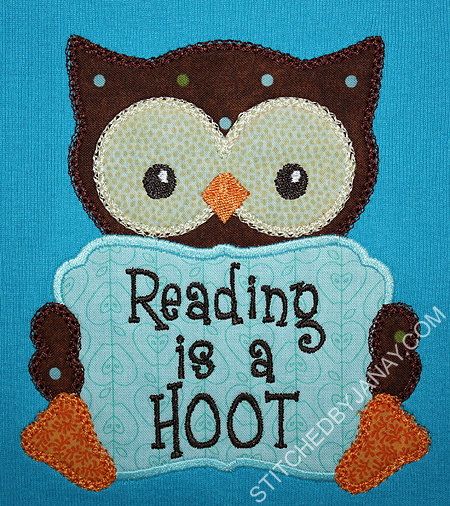 The owl design can be purchased from East Coast Applique (via the shop tab on her Facebook page). The frame comes blank. 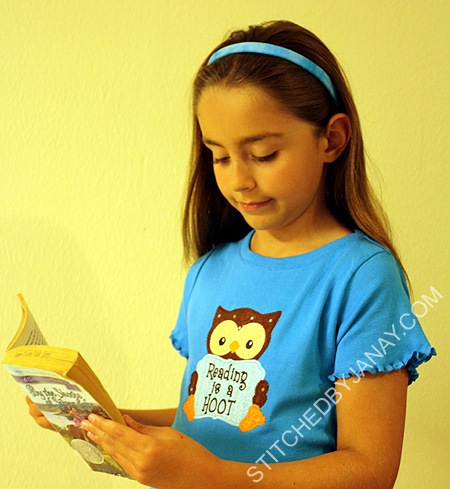 Since Annaliese already had a BTS shirt with "Third Grade" on it, she selected the phrase "Reading is a Hoot" (she thought the frame was a book). I used the Green Bean font from 8 Claws and a Paw to add the text. 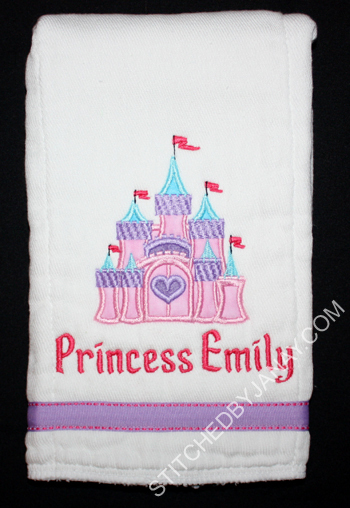 Michelle requested something princess for a burp cloth, so I chose Lynnie Pinnie's Fancy Castle Applique. I used the Cinderella font from 8 Claws and a Paw to add her name, it was a perfect choice! 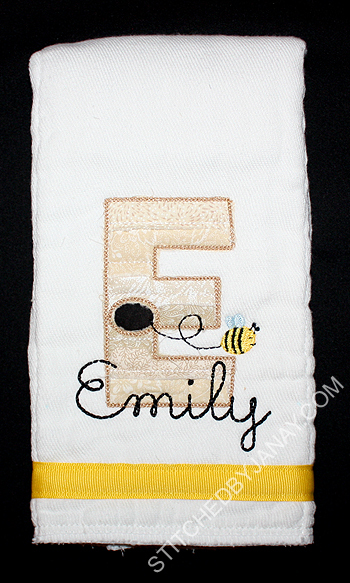 For the burp cloth I gave Emily, I used the Beehive Alphabet from East Coast Applique and added her name with the Hand Lettered Floss Stitch font from Jolson's Designs. I think it's only the second time I've used this font, but it was a perfect fit to coordinate with the flutter path trailing behind the bee. 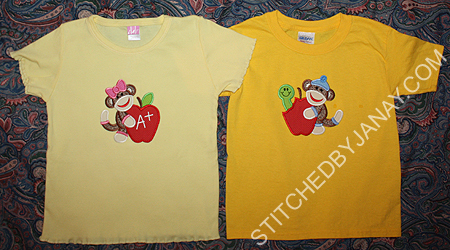 The applique A is from Embroidery Boutique's Cute Alphabet. I used Cleopatra from 8 Claws and a Paw to stitch her name. I really like this pairing! 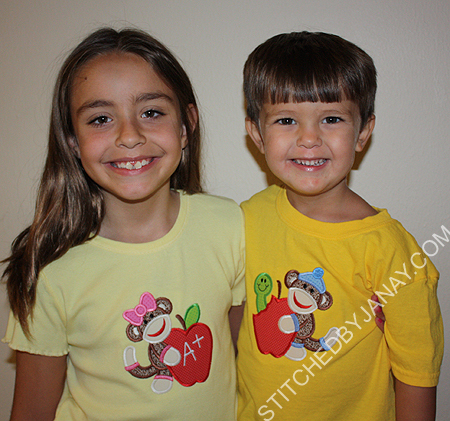 I love these sibling designs from MCA Applique. After using them on a recent set I knew I wanted to give them a go again, but with different little add-ons to personalize it even further. Jonathan is WAY into firefighters. And I heard through the grapevine that my friend is decorating Emily's nursery with a princess theme. So I contacted Melissa at MCA to see if she was interested in digitizing a fire helmet and crown to include in her "toppers" series. Boy did she deliver, and fast!! Don't hesitate to ask a digitizer if you have an idea -- they may run with it faster than you can search for a decent alternative! Thank you again Melissa, they turned out awesome!! 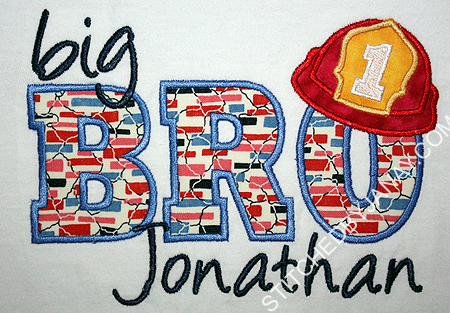 Jonathan's design has the Fireman's Hat merged on top. I used MCA's Angelina font to add his name. Emily's design has the Princess Crown merged on top. And notice I used the same fabric? I've been anxious to try this fabric on a boy/girl sibling set, pulling out the blue for the boy and the pink for the girl. I think it works! 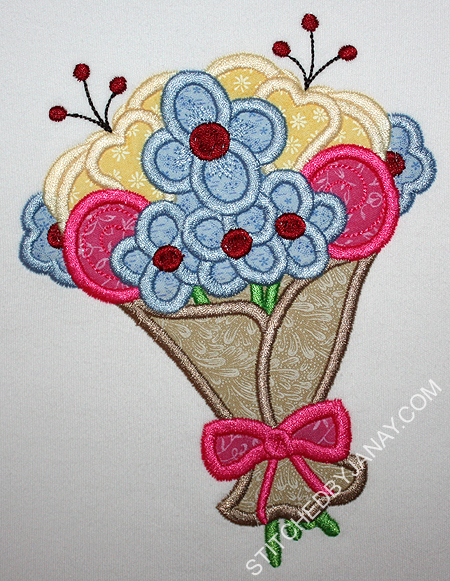 I used the Cade Applique Alphabet from Embroidery Boutique. I love this zig zag font! It resizes well, even when I have to squish it to make it fit in my 10" hoop. I increased the pull compensation to make up for the resizing and got to work! First I recreated Ella and Grant's gator shirts from last year, except new color palettes and text. 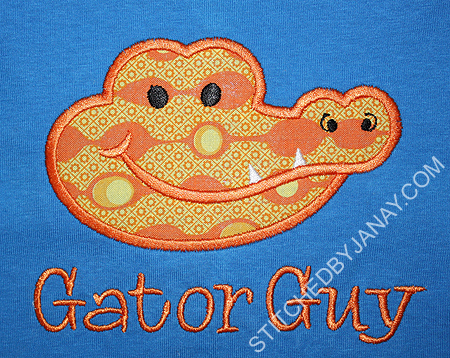 I used Lynnie Pinnie's Alligator Head for Grant, and used Whoa Nelly from 8 Claws and a Paw to the text. I used LP's Girl Alligator Head for Ella. Love this fabric Carla found and doesn't she have the perfect name for this?? 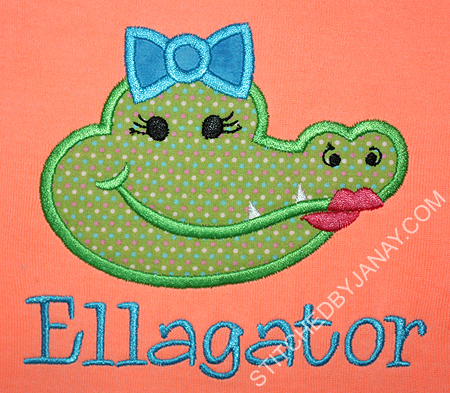 Ellagator. Love it. 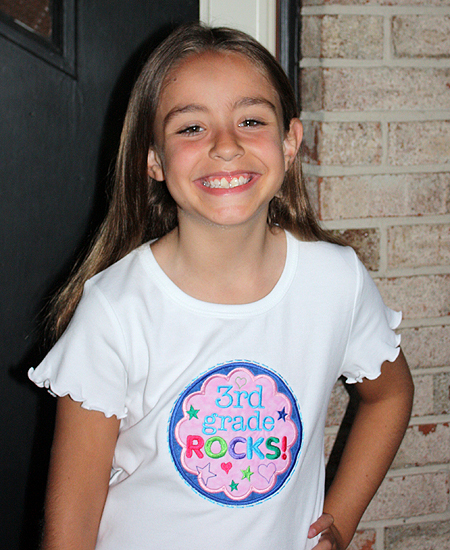 Ella's second grade shirt is a new design. 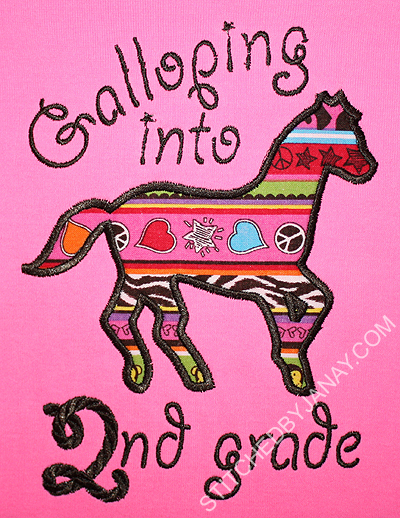 They requested the text with a horse applique. 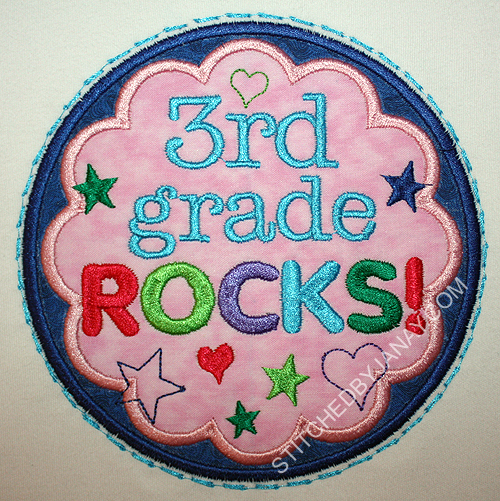 I used Applique Momma's silhouette design, and added the text with Clay from 8CP. Except that font doesn't come with numbers, and "Second" was just too long to spell out. 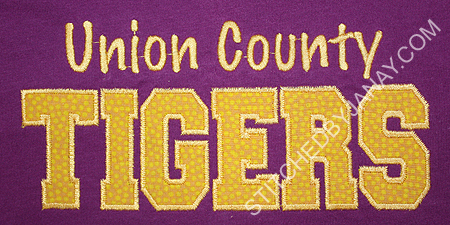 Thankfully I remembered that I had the Cowboy Rope version of the same font from Sew Weird Designs, and it had numbers! I like that the 2 is bigger than the rest of the text. It all came together nicely! 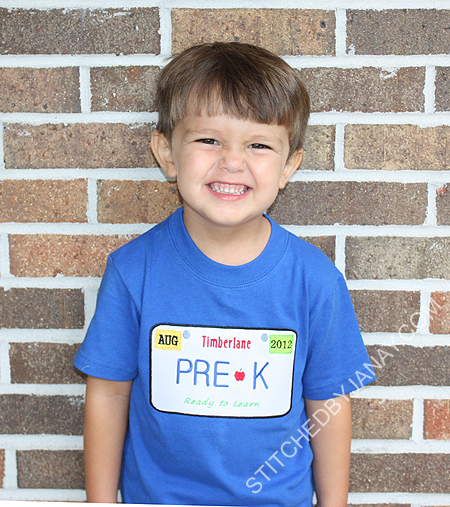 For Grant's first grade shirt, we modified the design we used last year for Ella. 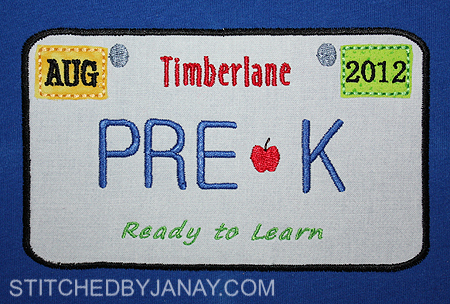 The design is Lynnie Pinnie's School Books applique with two modification -- instead of stitching "MATH" and "READING" on the spines as it comes, I changed it to "FIRST GRADE". 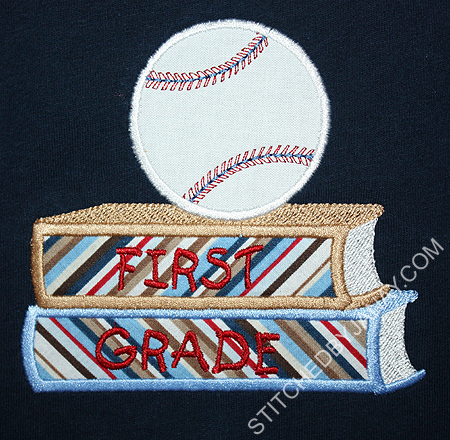 And they requested a baseball instead of an apple, so I snagged that from Embroidery Boutique's Baseball Glove design. This weekend I made a cute little bandana dress for an even cuter little girl! 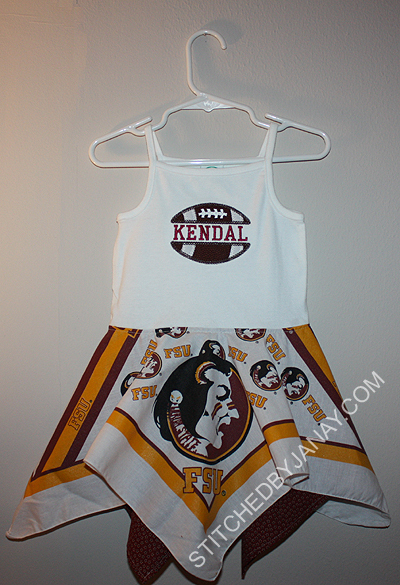 When Brittany saw Annaliese's Seminoles skirt, she wanted something similar for Kendal. 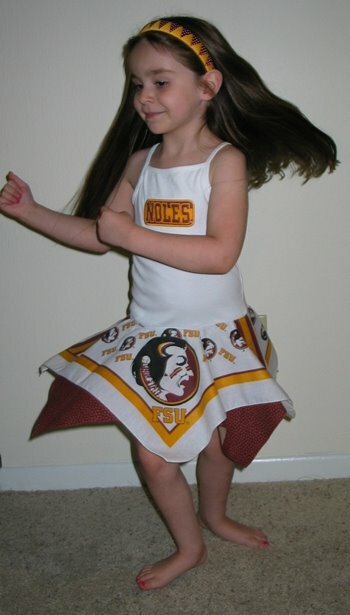 I used every bit of that fabric, but I knew I still had some FSU bandanas in my stash and could make her a dress like I did for Annaliese a few years ago. It turned out so cute!! 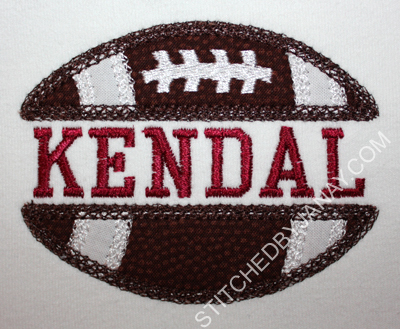 On the bodice, I used the Vintage Split Football Design from East Coast Applique. I added her name with College Block Small from 8 Claws and a Paw. 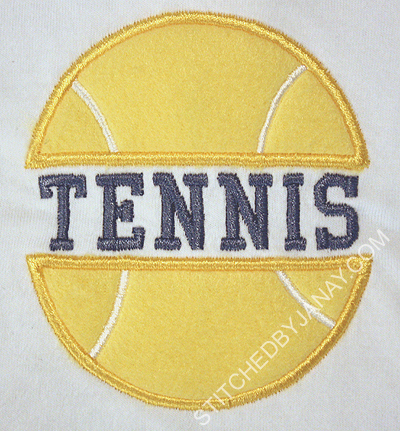 While I'm sharing this design, let me also show you the Split Tennis Ball design. 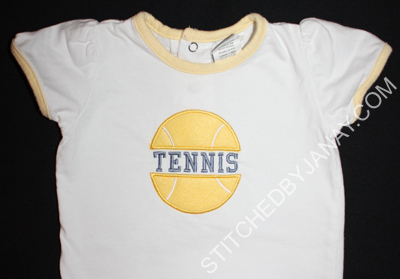 I tested this for ECA using yellow fleece and it turned out so cute! UGH. 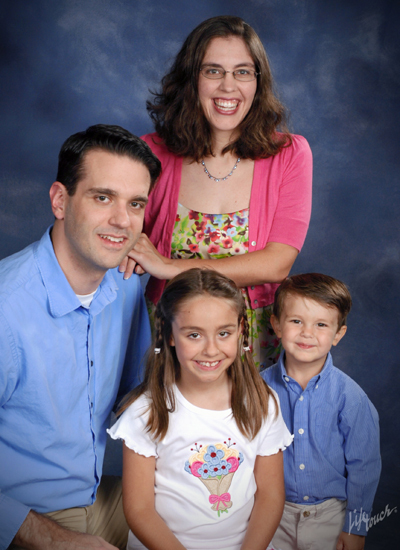 Family pictures for the church directory. They snuck up on me and I had no plan for our wardrobe. Frankly my husband and I have pretty boring closets, and our kids have tons of mommy and grandma made tees, but nothing appropriate for a good family portrait. I discovered in a box of hand-me-downs that Dashiell had a nice blue dress shirt that matched Carlin's. My one recent splurge of a nice dress had blue and khaki in it, so now all I had to figure out was what Annaliese would wear. She had a pink skirt that matched my pink sweater, but a solid white shirt just wouldn't do. Appliqué to the rescue!! 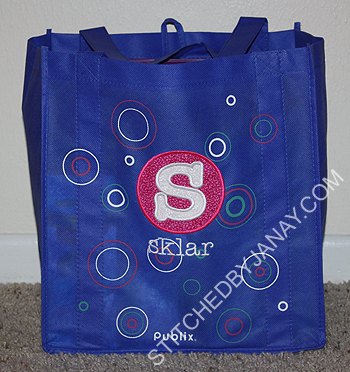 I'd much rather sew than shop!!! This flower bouquet is from Lynnie Pinnie, and I picked colors to match my dress. It turned out lovely!! The design is not available for purchase yet, I'll update the info when it is.